Careful management of ewes during late pregnancy is key to a trouble-free lambing and for the discerning shepherd, Megastart Ewe & Lamb can form a key part of this strategy. Ensuring ewes are healthy, in the right body condition and fed the correct diet during the final 6 weeks of pregnancy when 70% of foetal growth occurs, will pay dividends when the lambs are safely born and well mothered. Scanning will sort the pregnant ewes in to single and multiple lamb groups to allow for targeted management and nutrition. Particular attention to gradually increasing the energy intake during the last 6-8 weeks of pregnancy will reduce the risk of twin lamb disease and forage analysis and advice from a registered feed advisor can help determine the amount of supplementary feed required. Apart from energy during these last few weeks, the balance of protein, trace minerals and vitamins are all factors in producing good quality colostrum for the lambs. Colostrum is the first chance for the ewe to pass on nutrients and antibodies and is probably the most important feed a newborn lamb will ever get. Colostrum production starts in the final month of pregnancy. 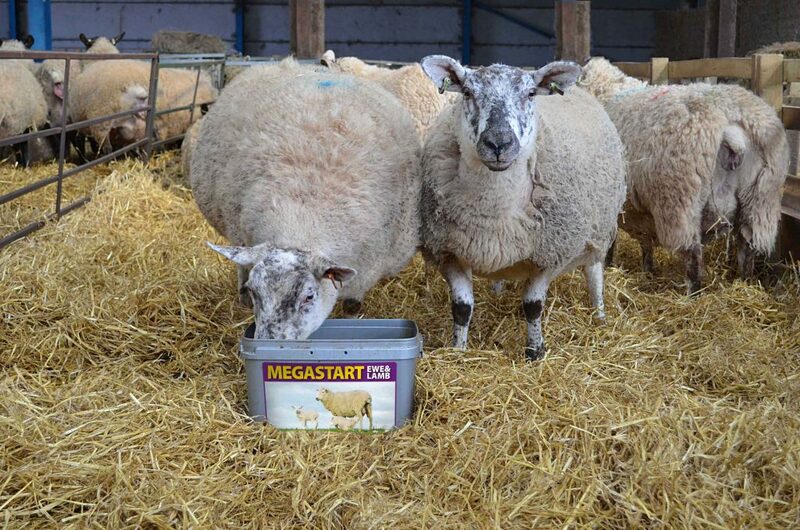 Megastart Ewe & Lamb is a free-choice feed lick designed to supplement the ewe during the 4-6 weeks before lambing. With intakes between 100-150g per day Megastart Ewe & Lamb supplies high energy, high quality protein, Vitamin E and selenium, important factors in the production of rich colostrum. Megastart also incorporates a specific cell wall material produced from a single strain of yeast and hence very consistent in quality. The yeast product contains a high level of specific sugars called mannan oligosaccharides (MOS) and beta glucans, inclusion of which has been shown to stimulate the immune system and improve colostrum quality and yield.